Over the next two weeks, I will go through the albums that were definitely some of the best this year, concluding with my favorite on New Years Eve. The honorable mentions are in no specific order, just the ones I decide to write about. Check out the first two after the jump. Producer extraordinaire Aaron Sprinkle shows that he isn't just a producer for some of the best albums of the last five years, producing records by Anberlin, Copeland, Acceptance, Gatsby's American Dream, and Emery. With this album, Sprinkle shows he can be just as good as those band. Obviously, the production is top notch, and the songs are definitely varied between upbeat guitar tracks like "One Last Time" and "It's Doubtful" and slow piano ballads like "Take Some Risks" and the Aaron Marsh featuring "The Worse for The Wear". Every song has a killer hook, and the lyrics are carefully crafted. 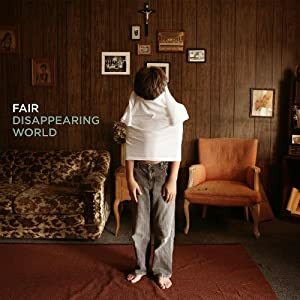 Many people may have forgotten about this album due to it being a low-key release early in the year, but Disappearing World is worth going back to again and again. Ace Enders has slowly become my favorite musician out there. He has one of the most passionate deliveries in music, implanting himself as my favorite act at Warped Tour this year. His oldest band, The Early November, released one of the most beloved albums of the decade with The Room's Too Cold. But the thing that makes me respect him the most is being able to balance his machine-like creation of music with his wife and child. The World We Know is an exceptional album, with lyrics spewing out of Ace's heart just as powerful as they are coming out of his mouth. The orchestration is simple, usually only using a guitar and slight percussion allowing the vocals and lyrics to radiate throughout the record. Don't be expecting very many upbeat singles, as this incredibly personal record is slow and cohesive. In fact, Ace originally meant for the album to be released as one track, played all the way through. This is the perfect rainy day record, meant to be checked out with a pair of headphones and a strong attention span.